Attorney Adam Burke focuses exclusively on criminal defense. He will challenge the prosecution and law enforcement by placing the burden back where it belongs, squarely on the government. He will aggressively challenge every piece of evidence, every witness, and every aspect of the government’s handling of your case until your legal defense goals have been reached. If you do not hire an experienced criminal defense attorney, you may face severe penalties. Call Attorney Adam Burke now for a free consultation at (614) 280-9122. White Collar Crime can be defined as non-violent crimes committed for financial gain. It is often, but not always, committed by business or professional people through their occupation. Additionally, white collar offenses are frequently charged in federal court. This is particularly true when the offenses involve high dollar amounts, multiple states and high profile public figures. However, many white collar crimes are also prosecuted at the State level. Two of the most of the most common categories of white collar offenses include Racketeering and Fraud. Racketeering. The term racketeering refers to the offense of obtaining money through an illegal enterprise. RICO is short for the Racketeer Influenced and Corrupt Organizations Act originally passed by Congress in 1970. Congress passed the RICO statute to target organized crime and racketeering enterprises by extending criminal liability to superiors for the actions of their subordinates. Fraud. Federal law defines Fraud as knowingly using a trick or scheme to falsify or conceal a material fact, make a false statement or a false document. Ref: 18 USC § 1001. If you have been charged with a white collar crime in Franklin County or any of the surrounding areas in Ohio, contact attorney Adam Burke to discuss the circumstances of your case and develop a defense strategy to fight for your future. 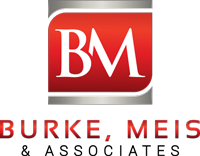 Call Burke, Meis & Associates at (614) 280-9122 for a free consultation about your white collar offense.